A community where everyone feels secure and empowered to practice their potential. A community that embraces diversity. A community where everyone is welcome and feels at home. In 2000, a small group of people began making lunches and passing them out on Saturdays to neighbors living in the apartment buildings on Cedar Street and Locust Street in Canby. Since then, our organization has had a continued presence in Canby, serving thousands of meals, hosting community celebrations, sharing produce and providing valuable information in the Locust Street neighborhood. Amidst all the food and fun the real goal has always been to build relationships across cultural and economic boundaries. Often, when we see people in our community who are different from us, it’s natural to feel nervous or fearful. Sometimes we just don’t know what to say, especially when language is a barrier. In 2010, we organized as Bridging Cultures as a nonprofit organization. We have continued to host picnics in Locust Street Park on summer weekends. Some of us barbecue hot dogs, and others fry up carne asada and serve jamaica. Before these events started, some of us lived in the Canby area for years without visiting the Locust Street neighborhood—now we have a reason to be there. In 2016, we will host our eighth annual Thanksgiving celebration and our fifth annual bus trip. 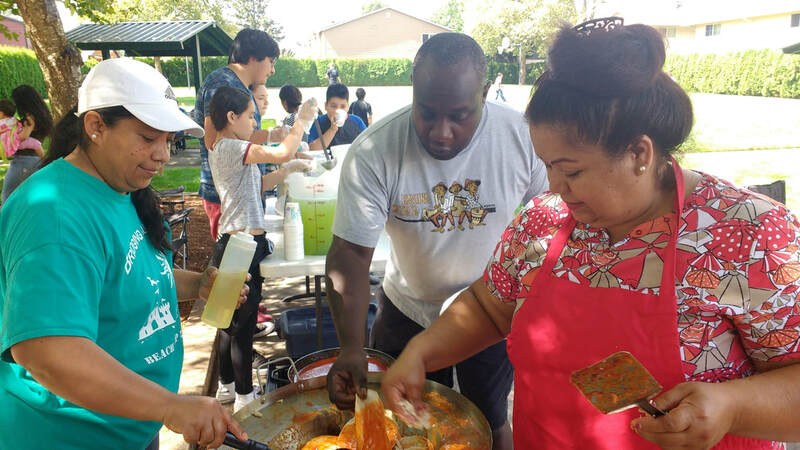 Over the past several years, these events have been increasingly organized and led by members of the Canby Latino community. We are growing! We have a 16-year track record building relationships in the Canby area. We want to expand our programs and continue to forge cross cultural friendships in our community. Bridge to language: We have a program in partnership with Clackamas Community College to provide adult English as a Second Language classes, with meals and childcare in Canby. We are now in our second year of this program. Bridge to our neighbors: We will continue our tradition of community barbecues at Locust Street Park and other local celebrations including our annual Bicultural Thanksgiving Dinner. Bridge to legal status: We will help immigrants navigate the confusing and expensive world of immigration. We'll provide information and referrals to qualified attorneys. Bridge to technology: We will support the summer STEAM (science, technology, engineering, art, and math) camp that teaches kids from diverse backgrounds to build and program their own computers. Bridge to leadership: We will provide opportunities to build up leaders in our community.